“Priam, who asked for the body of Hector from Achilles” – the first big work, which was written by eighteen Alexander Ivanov, while still a student at the Academy of Fine Arts. The author captured the scene of the 24th song “Iliad” by Homer. Without a doubt, the entire Homer poem was known to the young artist, and it was no coincidence that he chose this verse. Ivanov was always striving for the psychological expressiveness of images, therefore the moment of prayer and repentance of the Trojan King Priam was most suitable. Ivanov created the picture in accordance with the academic rules of classicism, but chose the most emotional moment. For this, he was awarded the small gold medal of the Society for the Encouragement of Artists. 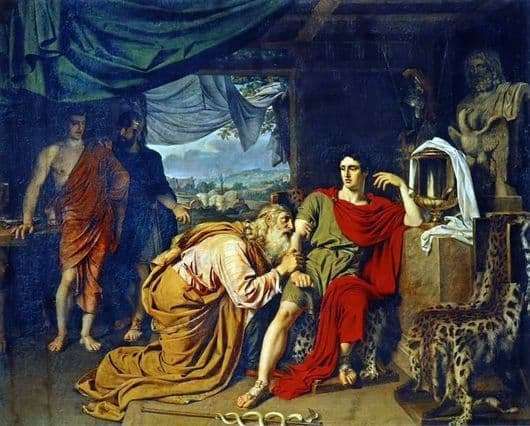 King Priam, intends to beg the body of his dead son from Achilles. For this he went to the enemy camp under the cover of night. The Trojan King offers a generous ransom for the body of Hector, slain at the walls of Troy. We see Priam at the moment of complete despair and hopelessness. He crouched at the feet of his enemy and prayed for the mercy of the body of the deceased. Ivanov chose the moment when the decision has not yet been made, although the denouement is already known. Achilles was sitting, immersed in deep grief over his comrade Patroclus, and seemed to wake up at the touch of the hand of the old king. With his unusual plot, Ivanov expanded the possibilities of an academic production. Expressiveness and archaeological accuracy are characteristic of the artist, so he chose a complex production. In the same 1824, the picture presented at the exhibition. Critics noted that the author was very attentive to details. At the feet of Priam was a caduceus, the rod of Hermes, a symbol of his invisible presence. According to legend, the Trojan king managed to get into the camp of the Greeks only thanks to the Greek god – the patron of commerce. Do not lose sight of the subject, near which sits Achilles. It is nothing but a funerary urn with the ashes of Patroclus, a close friend and ally of Achilles.